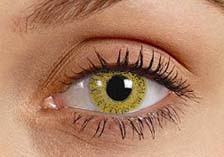 Yellow contact lenses are suitable for many fancy dress costumes, especially movie characters or alien costumes. We compare the prices of several UK suppliers for yellow contact lenses in a range of different sizes and styles. Please see below. Alternatively we have pages for coloured contact lenses (if you are not looking for yellow), halloween lenses and cat eye lenses.